Blueline Floor Coverings is the best choice for carpet sales and installation in San Mateo County. We are a professional, fully licensed flooring contractor with over 20 years of experience and thousands of satisfied clients throughout including Belmont, San Carlos, Burlingame, and surrounding areas. Our excellent workmanship, affordable prices, and personalized customer service have earned us a five-star average rating on Yelp and a stellar reputation among our past customers. Before you decide to buy from one of the big home improvement stores, stop by our 1,000 square foot carpet and flooring showroom in San Mateo to view an extensive selection of high-quality, competitively priced carpet materials from trusted name brands like Woolshire, Stainmaster, Dixie Carpet, and more. One of our friendly, knowledgeable staff members can offer advice on choosing the perfect carpet for your needs and budget. We offer free onsite consultations and estimates, and stand behind our work with a 1-year labor warranty. Modern wall-to-wall carpets come in a wide range of synthetic and natural materials, including polyester, nylon, olefin, wool, and other natural fibers. They are also available in many choices of textures, weaves, and styles, such as berber, textured, shag, and plush carpet, and come in hundreds of unique shades, patterns, and prints. At Blueline Floors, we have the industry knowledge and hands-on expertise to know which carpet style is ideal for your specific application, whether you need colorfast, stain-resistant wool carpet for your entire home, plush carpet for a single bedroom, or resilient, high traffic carpet for multiple office buildings. 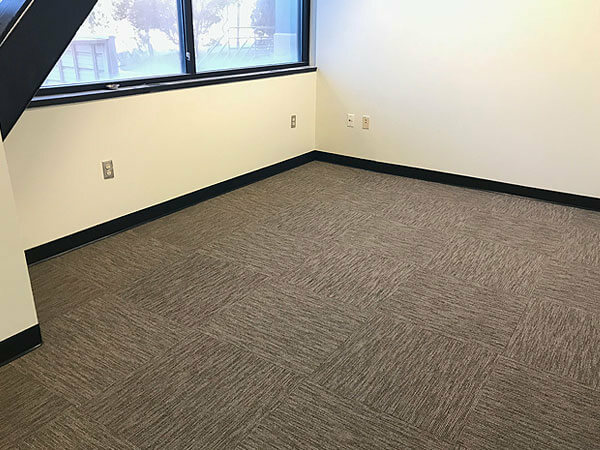 We also offer carpet installation for commercial businesses, industrial facilities, and wall carpeting for soundrooms. Our carpet installers have an average of 10 years of experience, and are supervised by our owner and foreman, who each have over 20 years of experience each in professional flooring installation. By using meticulous attention to detail and the industry's best practices, we ensure that every carpet installation is completed to be durable and long-lasting, with well-placed seams and no loose ends. Most of our wall-to-wall carpets can be installed in only 1-2 days with minimal disruption to your home or business. At Blueline Floors, we are dedicated to providing a level of attentive customer service that you simply won't find from the big box stores. We always go the extra mile to ensure that every carpet installation is completed on time, in budget, and to the highest standards of quality. If you do notice a problem after installation, we will return and resolve the issue as quickly as possible and at your earliest convenience. Contact us today to schedule a FREE onsite carpeting consultation and estimate.